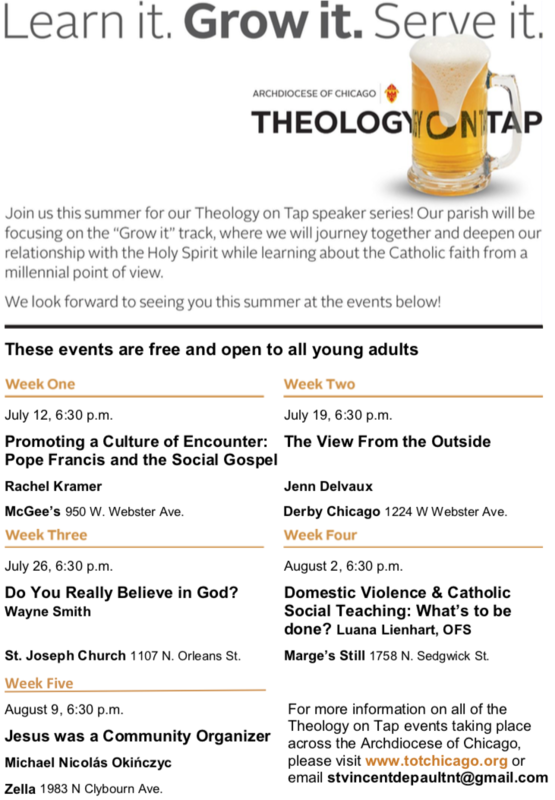 The Archdiocese of Chicago is excited to announce the launch of a revitalized Theology on Tap for Summer 2018! This year, Theology on Tap will help support and celebrate your spiritual growth as you explore how God is present in your life in a number of new and exhilarating ways. The Archdiocese of Chicago Theology on Tap events will focus on learning about your faith, growing in your faith, or serving through your faith; deepening your relationship with Jesus Christ your way. St. Vincent de Paul will be hosting Theology on Tap in collaboration with Immaculate Conception-St. Joseph, St. Michael’s in Old Town and St. Teresa of Avila. Below is the 2018 calendar. Click here for assistance with directions and locations. Please email stvincentdepaultnt@gmail.com for more information.